Four function, Sequential Air Switch. See catalog pages below. 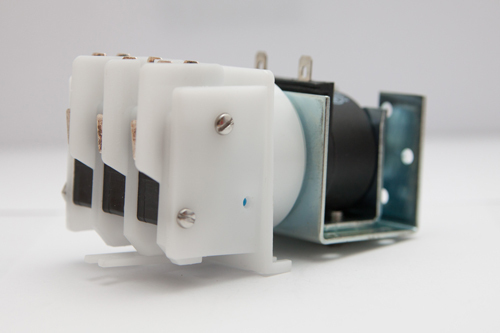 Special Feature: Solenoid for air switching distances of 100 feet. Micro Switch Terminals are square to solenoid terminals. Additional Description: MSA325B Magictrol Air Switch. Four function air switch actuates up to 100 feet from air bellow. Sequential air switch is 3PDT, 25A@240VAC. In stock. Direct from manufacturer. Solenoid actuated four function sequencing switch. Solenoid is pulsed on and off for each Magictrol sequence step.